Coalition speculation dominates today's agenda. Could Nick Clegg become his party's Ramsay MacDonald or is a Lab-Lib coalition still most likely? Coalition speculation dominates today’s media. The focus has been on Nick Clegg’s remarks on Andrew Marr yesterday which the Guardian have interpreted to mean that he would not “prop up Labour if they become third“. They have been partly misinterpreted and it is a different red line of Clegg’s which should be remembered. As Alan Johnson makes clear, “it doesn’t take a genius to think that if you are third in the popular vote, then … you are not best-placed to deal with it.” If Labour comes third, even if they had the most seats, it is hard to see how Brown could stay in Number 10. Does that therefore imply that a Cameron-Clegg coalition is an inevitability? Almost anything could happen after May 7th but three scenarios have not been given a proper airing. If Labour comes first or second in the popular vote (and therefore, in all likelihood, have the most seats), Gordon Brown has every constitutional right to stay on as Prime Minister and invite the Lib Dems to join a reform government intent on changing the electoral system and ushering in a new era of progressive politics. If Labour came third, the tables could be turned with Nick Clegg inviting Labour Ministers to join him in a Lib-Lab government with a similar agenda. Neither of these scenarios contradict Clegg’s formulation on Andrew Marr. By contrast, David Cameron’s remarks this morning seem to place the Lib Dems and Conservatives at odds on arguably the defining issue of a post-hung parliament settlement: electoral reform. A coalition involving Clegg and Cameron could could probably happen in one instance: if Nick Clegg decided to put personal ambition ahead of party unity. This would make him his party’s Ramsay Macdonald (perhaps as Cameron’s Home Secretary) while Vince Cable could play the role of Philip Snowden and become Chancellor. Clegg would be mad to prop up Labour. He can’t be both for change and also pro the status quo. http://www.leftfootforward.org/2010/04/lib-con-coalition-only-if-clegg-does-a-ramsay-mac/ would be great, he'd set them back twenty years! 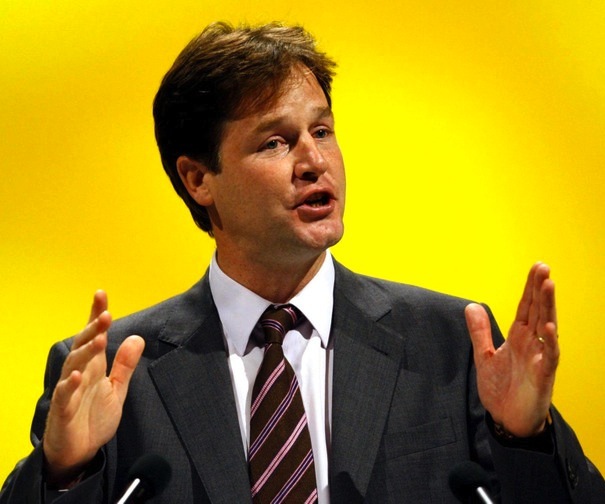 Clegg can’t put personal ambition ahead of party unity – he needs the support of the Parliamentary party to enter into a coalition! The debate Speakers’ Corner Trust has published today on “Fair Votes or Firm Government: Do We Have to Choose?” between Ken Ritchie of the Electoral Reform Society and Lord Norton may be of interest. Will – With Brown less popular than Michael Foot at his lowest point and Labour running in third well behind the Lib-Dems you cannot blame Clegg. Personally I’m still going on the Tories by a small margin but either way Labour will have to do what right thinking supporters have been saying all along about ridding the party of the useless Gordon Brown. Sneaking the Prime Minister between safe venues is in complete contradiction to John Major on his soapbox and members of Labour should be screaming in frustration at the state he and his bullying cronies have left the party in. I never thought I’d say it Will but I’d even prefer the hopeless David Miliband at these televised debates that the terminally incompetent Gordon Brown – at least he looks the same as the other two. I think in the future a more consensual approach to politics should be order of the day and this site could do well to start adopting a far less partisan stance which results in frankly silly childish stories by some of the postings here. Fascinating post, and on the ball with your analysis but for one thing. It is Cameron who would be the new Ramsay Macdonald, I suspect, not Clegg. It is Cameron’s party that is already suspicious of him, and would cast him aside if he tried to do a power-sharing deal with Clegg. I feel as do many people that we are moving into new political epoch and it led me to think of the similarities and differences between now and the last time we saw a seismic shift in politics when Labour replaced the Liberals as the party of the left. But first by way of explanation a little on the career of Herbert Asquith. From non conformist stock Asquith was marked down as a politician of promise in the 1890s. The Liberal landslide of 1906 saw Asquith become the Chancellor of the Exchequer in a reforming government. A government that ushered in the beginnings of a welfare state. In 1908 Asquith became Prime Minister, the following years saw the introduction of the Old Age Pension as well as a titanic battle over parliamentary reform against a Tory dominated House of Lords. In 1914 and as everyone knows the First World War breaks out. As the carnage develops tensions between Asquith and the charismatic Lloyd George eventually see Asquith replaced by LG in December 1916. It is the period after the War that is the most interesting. The early 1920s sees economic problems a resurgent Tory Party and the rise of Labour. Asquith and Lloyd George eventually sink their differences but it is the election of 1923 which matches the present political climate. The election in December sees the Tories under 0n 285, Asquiths Liberals on 158 and the Labour party under Ramsay McDonald on 191. After the election the parties debate who should form the Government the previous PM the Tory Baldwin realsises that he cannot form a government Asquith is consulted by the King’s Private Secretary and suggests that this is an ideal time to try a Labour Government. Asquith feels closest to Labour on the issue of Free Trade. The Tories are protectionist. Macdonald becomes PM in January 24 and the Liberals never sniff the prospect of serious power for many years afterwards. The similarities between Brown and Asquith. Both non conformists, both Chancellors of the Exchequer, both have Fife constituencies, both have deadly rivals. A lib-con pact just would not work; the 2 are too far apart. As 1 commentator in the Guardian once put it, though, it would be fun to watch. Aaaah the time of the Zinoviev letter published by the Daily Mail. Corrupt journalism at its finest on behalf of the Conservative party. Plus cas change, plus c’est la meme chose. I think it probably makes Gordon Brown appear as Arthur Henderson – which is probably a bit generous to him (but it’s even harder to see him as george Lansbury). If he comes third he’s clearly dead in the water, but will Labour be able to think on its feet when it’s likely to take three months to find a new leader (unless there’s a party stictch up, which seems unlikely when there are so many claimants to the throne). This alone may make a Cameron/Clegg deal more likely, for all the doubts it will raise within both parties (this matters more for the Lib Dems of course because they historically practice something like party democracy). But let’s all pray its not Cameron leading the largest party with support from assorted Unionists – then all bets really will be off.